It’s Taper Time! (Alone and Naked at the Track) | So What? I run. Two weeks before the marathon and I’m now in taper mode. After Saturday’s half marathon, I decided to take off on Sunday and do Yin Yoga. Yesterday, I didn’t do a damn thing. I planned on doing “something,” but it just didn’t happen. Tuesday’s are our normal track workout days, but our training group was having a celebration for all those who ran in the Baltimore Running Festival today. While I wanted to be with my runners, I needed to stay disciplined and stick with the training. So, I went to the track, alone and naked. No, not naked as in not wearing clothes, but naked as in no running belt, no cell phone, no inhaler, no iPod, nothing…oh wait! I had my Garmin, so I guess I was semi-naked. Today, I picked #4 per suggestion of my coach. To switch it up a bit, I ran in the opposite direction (clockwise) during the 1200’s. I actually liked it a lot better! When I ran in the normal direction (counter-clockwise) I was actually a little disoriented. It was nice to switch it up a bit. Running alone was actually refreshing. All I had was the sound of my clomping feet and my asthmatic weezing breathing (Note to self: carry inhaler when running). Our bodies and minds like routine. If you run four days per week, then run four days per week during your peaking phase. If you run six, then run six. 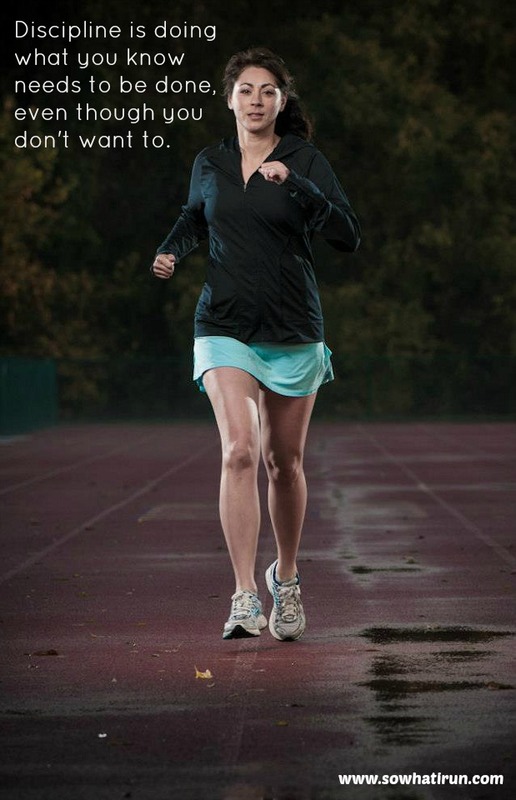 You’ll feel flat if you suddenly run less frequently than normal. Over the last 10-14 days before your race, you should progressively reduce the volume of your running. Two weeks out from the race, I like to reduce the daily volume by 10-20 minutes or so. While we may want to reduce the volume of running, we do not want to reduce the intensity of our workouts. In fact, we may want the intensity to increase. You want to keep your engine revved, the pumps primed. Most distance runners have the same race strategy — start conservative, build into race pace, run as efficiently as possible and get as deep in the race as possible before you have to pull out your superman or superwoman powers to get you to the finish line. I like athletes to reflect on training in two ways. First, think back on a particularly tough workout, something where you didn’t feel great but you gutted it out. You were tough. This shows that you can do it. You are tough. You can handle the ups and downs of running and get to the finish line. I love #6. Later this week, I’ll talk about tapering mistakes and eating during taper. 11 Days! Is that it?!?!? This entry was posted in Marathon Training and tagged discipline, Marathon Running, marine corps marathon, MCM Training, Physical exercise, Road Running, taper, track, Training by SoWhatIRun. Bookmark the permalink. Yin yoga is honestly my favorite way to unwind, and stretch out tired muscles. I wish more runners were aware of Yin yoga. It’s so beneficial. Thanks for stopping by! thankyou for sharing that article. When I did my taper it just felt wrong. I wondered if I was undoing some of my training. What you shared makes a ton of sense.